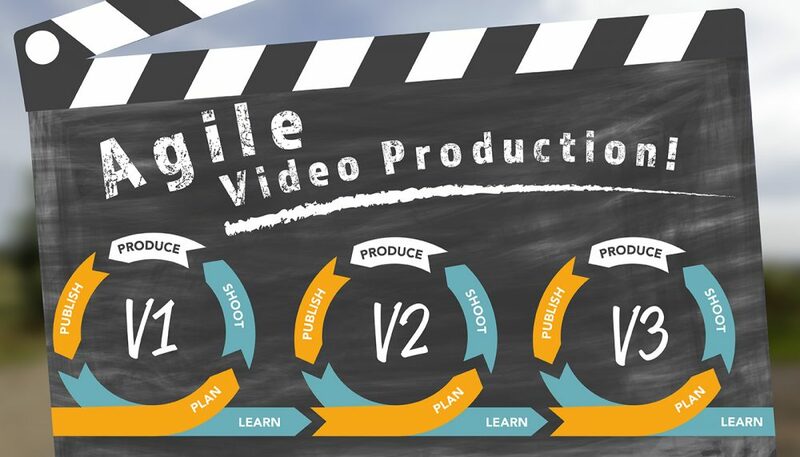 Get Agile in video or Get Gone. Agile Video production will increase volume and lower costs. Welcome to the great acceleration. Where the pace of change and the speed of communications is rewriting the rules of marketing on an almost weekly basis. Driving this change is the pace at which we consume information, and the form of that information. Video is leading that form change. With the majority of digital content being distributed on the internet set to be video, ( video traffic will be 82 percent of all IP traffic (both business and consumer) by 2021, up from 73 percent in 2016) the need for businesses to embrace video is obvious. The problem for many companies who want to use video in their marketing is that the pace of change is so rapid conventional production doesn’t produce enough video, fast enough, affordably, to make video a viable marketing tool. When content value is measured in hours, taking months to produce that content is a non-starter. Most video production companies use a traditional waterfall methodology of production, where research, storyboarding and stakeholder involvement is used via multiple feedback loops to attempt to produce a “Big Bang” video which produces maximum engagement and delivers a big message or theme. The problem with this video production methodology is that it’s not able to react quickly to change, it’s long winded, (one production company we know has a 28 page guide to producing a video…..) and it’s expensive. And it’s not just the external costs which are high, the internal costs are often higher still and not transparent when embarking on a production. And this approach doesn’t minimise risk for the client. In fact, quite the opposite. It removes risk from the production company, and moves it onto the client’s shoulders. If the project fails, the hidden internal costs to the business makes the cost of this failure higher than might at first appear, and the odds on failure are elevated by bringing in too much external stakeholder involvement, slowing project delivery, embracing non-expertise as part of the message, and disrupting the production team’s processes. This can taint the client experience and place a barrier in the way of using more video going forward. If companies are going to benefit from the video revolution, we need to fix this. We get Agile, and we get Lean. The IT industry has been using agile production for years, and this has reduced time to market, increased innovation, upped volumes and cut costs. Instead of one “Big Bang” they go for iterations. They work in connected teams, they sprint. This has brought more apps to market more rapidly, with more rapid changes to meet evolving user demands and stay relevant. We also need to adopt lean production methods. We need to embrace Muri, keeping the flow of our work constant and avoiding experimentation on the client’s time. Sprinting does this. It reduces our downtime, it gets us doing things when they need to be done, it brings teams together as an organic whole who feed off each other and can bring about change in a project rapidly. By rejecting the “Big Bang” concept of video production, embracing iterations and using proven forms of corporate videos, we are able to produce greater volumes which engage sooner and allow us to change and adapt messages, learn and fine tune, getting a faster return on investment and reducing risks. Video production is built into the corporate ethos, producing a video is no longer a big deal, requiring huge stakeholder involvement, it’s a normal business function. In digital marketing the combination of rejecting the “Big Bang”, using iterations, and lean manufacturing is often know as “MVP”, or minimal viable product. We prefer to think of this as Maximum Value Product, because videos produced using this method are not minimal, they are optimal. Producing videos in this way brings us to the optimum production nexus, where speed, quantity and quality come together to produce a stream of brand aware timely messages which make best use of the new marketing channels opened up by video. Now this doesn’t suit all businesses. If a business is reluctant to trust their production company, or high level corporate stakeholders are keen to be highly involved, then agile production may fall back into a waterfall system. But for businesses who want results, and embrace the ethos of agile, it works. Page One has produced over 200 corporate business videos using our agile methodology. It works. For one of our clients we have produced 29 videos which on average attracted six times the number of viewers of the average YouTube video, placing them in the top 20% of all YouTube videos by number of views. And five of these videos are in the top 5%. One recent video for this client attracted 14,500 views on Facebook, 1300 views on YouTube, and 200 shares, in three hours. Contact us to embrace agile methods for your next corporate business video production.